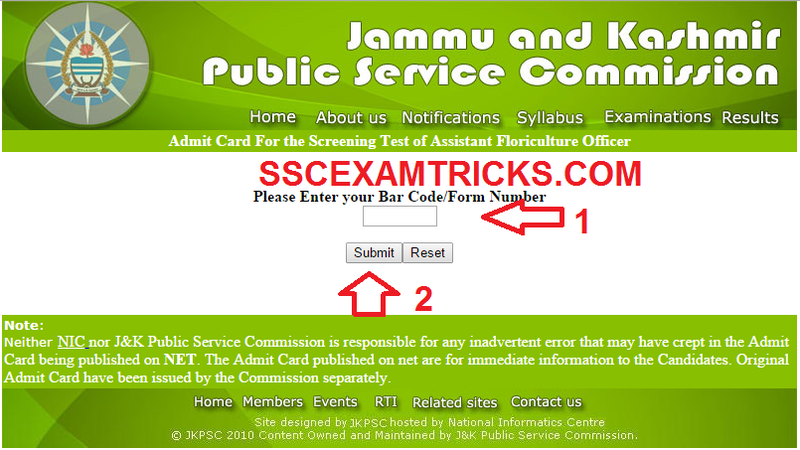 Jammu & Kashmir Public Service Commission has released online admit cards / call letter for the Screening Test to Short List candidates for interview which is schedule on 15th February 2015 at 11:00 AM to 1:00 PM against Notification No.01-PSC (DR-P) of 2014 dated 22.01.2014 for the posts of Assistant Floriculture Officer (AFO) in Bureau of Public Enterprise and Floriculture Department in respect of Kashmir based candidates at Sri Nagar and Jammu centres. JKPSC had released the list of shortlisted candidates appearing for written examination. A huge numbers of candidates had applied for these posts from all over the state. Those candidates who had applied for these posts can downloads their admit cards from the direct link provided in the end. It is mandatory for the candidates to bring downloaded admit cards. Candidates are advised to note down the venue of exam and read all the instruction provided at the bottom of the admit cards. Candidate must ensure the documents required such as ID proof i.e. driving license, PAN card etc. before appearing in exam. Candidate must bring at least one photocopy of ID proof to the venue of exam. Candidates have to affix colour photograph in printed admit card to the provided space. Admit Card must be signed properly below the Colored photograph paste by the candidate. It is noted that use of mobile phone/Calculator/Electronic gadgets is not allowed in exam room. · Enter Bar Code or Form No.